An ambulance whizzes through busy Indian metro traffic, siren blaring. Rush hour for evening commuters makes it harder and harder to push through main roads. The paramedics are hard at work trying to resuscitate their patient in the back of the ambulance – but need to get to a hospital quickly. Now picture this scenario. An emergency doctor is beamed into the ambulance and provides timely guidance to the paramedics regarding next steps. The ambulance driver meanwhile is guided in real-time by a reliable, fast and accurate GPS system that shows him a path with less traffic. These two technological interventions could save lives at a time when each second counts. Quality of cables is measured in ‘counts’. High count cables allow data to travel at faster speeds, for longer distances, maintain its integrity and the cables can withstand extreme conditions like under oceans or at very high altitudes. A one-size-fits-all approach is not effective and using low-count cables could lead to data delays (latency) or a reduction or loss of signal (attenuation). 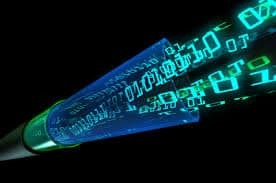 It is extremely important therefore that for futureproofing our networks for the increasingly bandwidth-hungry applications of tomorrow, high count fibre of 864 count fibre count is deployed, especially in cities. While naysayers might grumble about the higher deployment costs and the operational challenges in maintaining underground fibre, one has to only remember that all these are worthwhile and more when we realise that the incremental effort can fetch us as much as 25 times capacity! Research inputs by Ms. Chandana Bala.